I took this image during the G8 summit at Gleneagles in Auchterarder, Perthshire, in July 2005. At the summit, world leaders met to discuss issues including global warming and aid to Africa. Thousands of police officers were drafted in from across the UK and there were clashes with protesters. There had been a great deal of trouble at other G8 summits around the world, so there was a heavy police presence here. A lot of people travelled from one G8 summit to the next to protest and the organisers weren?t taking any chances. The demonstrations at Gleneagles led to more than 350 arrests and several police officers were injured. My role was primarily to document the trouble that was taking place outside the summit using my Canon EOS-1D Mark II DSLR with a 70-200mm lens. Everywhere I looked there were huge crowds of protesters and large numbers of riot police. A protest march took place, but the route was so long that it was impossible for the police to marshal its entire length. There were gaps along the way where protesters could break through and make a run for where the summit was taking place. There was one spot in particular where they could reach the perimeter fence close to the summit. I, and some of the other photographers, realised that if the protesters were intent on causing major disruption, this was where they?d head for. I positioned myself at this spot and, sure enough, a few protesters sneaked through and ran across the field. 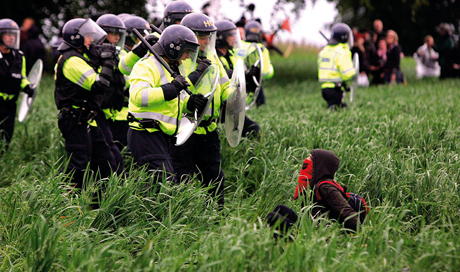 The police tried to round them up and that?s what you can see happening in this image. Tensions were high, so as a photographer you have to watch out for your safety and avoid being caught up in the trouble. In a situation like this where there is lots going on and there are hundreds of people, it is hard for police to distinguish between a member of the public who is taking photographs and a press photographer. Press photographers can look similar to protesters, especially since many members of the public own professional cameras. It?s becoming more of a problem and increasingly press photographers are being mistaken for members of the public. As a press photographer you?re always trying to photograph what?s in front of you, but it can be very difficult not to put your own stamp on an image ? your personal feelings will come through whether it is intentional or not, and you?re emotionally involved no matter how detached you think you are. Photographers aren?t machines. I was trying to convey the mood of the day, but I wasn?t supporting the protesters or the police. It was only the mood I was trying to capture. I?m from Northern Ireland and this is where I served my ?apprenticeship?. Unfortunately, Northern Ireland is synonymous with trouble, whether it be street disturbances or marches. When I was starting out I went to lots of demonstrations and events, and paid close attention to how other photographers behaved in different situations. Eventually, I learned how to cope with these situations and developed the necessary skills to capture the picture without getting involved in any trouble. When photographing a situation such as a demonstration or a protest, it?s important to learn to anticipate what might happen next. Troublesome situations develop very quickly. It?s safer to take the picture and then look around at what?s happening as you can?t hold the camera up to your eye for too long. While you want to get the shot, at the same time it?s crucial to maintain an awareness of what?s going on around you and not put yourself in unnecessary danger. Once you raise the camera to your eye it?s easy to think of it as a shield that will protect you, but of course it doesn?t. You have to work fast and make decisions quickly ? something that only comes with experience from being in these situations. You also have to know when enough is enough and get out. When you?re covering events such as these you can?t allow yourself to get caught up in the action, otherwise you may find you don?t have any good pictures when you get back to your car. Getting too close to the action can be a hindrance. Sometimes it?s good to work around the periphery of the action as you can observe from a distance and spot things to capture.